The photo of Tory Burch’s breakfast room in my Quadrille post from yesterday got me thinking. I love bold, graphic patterns, but tend to use them as accents against a more subdued background. As much as I am inclined to say that Tory’s breakfast room looks fabulous, I think there might be days in which I would wake up and find that having the same fabric on my walls, drapes and furniture was a bit nauseating. Designers had a tendency to use the same fabric all over back in the 1950s and 1960s and to make matters worse, a lot of times, the fabrics were chintz, which make my skin crawl. Am I missing something? I find the look to be too much for my taste. It’s sort of like having a burger, fries and milkshake. You can have one, maybe two, but all three at once is just too much! And yet, plenty of talented designers and stylish people have no qualms with all-over prints. Is this a look that you like? Is there something that makes it fabulous that I just don’t understand? I agree way too much I think Tory's nook gets a pass bc the color is gorgeous I think if it was any other color it would be just awful. Sorry, but this will be my first "hate it". Especially the 1st picture and second. I can't live with something like that! It's way too much! There's no harmony... it's even boring! All the same? Even curtains? No people... we need to be creative. Sure, design can be shocking at times and it can be great to appear on a magazine, but to LIVE everyday with it, it's just way too much! I'm with you. I can appreciate it sometimes, but I wouldn't want it in my house. I think I would feel too unsettled by so much pattern. No, Paloma I agree with you. Yesterday I did not mention Tory's breakfast area. I think it IS too much. I like to see the layering of a mix/ patterns solids, it almost seems dated ( as beautiful as some of the rooms are) to use the same matching print everywhere. I thought matching prints everywhere in a room is too much for my taste, too! It's dizzying, unsettling and it feels very dated. I think crazy bold prints like these are best reserved as accents, like you said! Yeah. It's too much. The color is lovely, but the pattern is overwhelming. As for the rest of them... Mom's voice just popped into my head, so I will stay mute on the matter! I agree... too much for me. I love prints but more subtle. I believe I would get tired in one week! LEAVE IT...this whole fabric on fabric on pattern on pattern thing makes me think White House....or 80's old lady lameness. I think if it's the right pattern (a VERY specific pattern!) Like an animal print which most times reads as a neutral it could be OK. And in a small cozy room. OK, I have a question - for yall who hate it - have you seen a room like this in person? I ask this because Bunny Williams (i think it was her) did a small office/closet at a show house a couple years ago and it was cheetah print with small bits of red trim and it looked AMAZING! I think some looks do not photograph well but in person look great. I actually love it...depending on the pattern of course! I've seen it done much better than any of these shots. I sort of love it, but I'm not sure I could live with it. It is a very monied, East Coast look, that's for sure. I'm absolutely with you. I noticed it yesterday when I read your last post. I think I find it unsettling to have that color or busy-ness on every surface. There's nothing beautifully simple to just soak in. I also like well-defined lines and I have a harder time distinguishing where the walls begin and the seating ends. It's not clean enough for me. I don't hate it, I just think it's a preference. You're not alone! No, I'm with you there. It's way too much. Maybe it's an acquired taste? After watching Million Dollar Decorators it seems the decorators don't always get their way - maybe their client wanted it and they did the best they could? Definitely feels 80s (like bad 80s) to me. 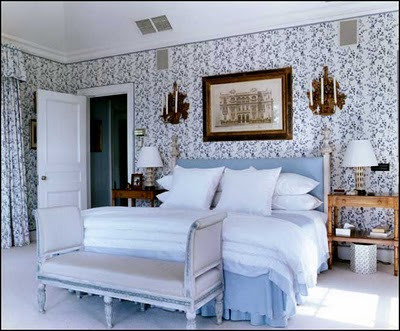 I think my bedroom as a little girl was slathered in Laura Ashley floral...yikes. Too much of a good thing. A little less and each room would be divine. it's definitely an acquired taste, that i haven't really acquired... however, maybe in a very small space with a very tone on tone fabric, with a very small scale pattern... maaaayyybe... it can be pulled off by the right person.. but i'm going with a general "no" for now. I love it. I don't always love the fabric that's picked, but I love the concept. It IS old-fashioned and traditional, which I think is part of the charm. Tory's kitchen is the large scale equivalent to taking a Queen Ann wing chair and reupholstering it in black and white chevron. The contrast of fussy design & graphic print is just fab to me. I think this look is a very bold one and can work depending on the look of the whole house. The problem with a look like this is that you can't tell where the individual elements of the design start and finish. A design like this has a very short shelf life, but maybe this is the point!